An Apple patent application has been discovered by Patently Apple which shows the company is developing a Virtual Reality (VR) system to be used for autonomous vehicles. Using the VR system, the interior walls of the vehicle could be used to provide a virtual/ or simulated view of the exterior environment, which in theory, could mean that no side windows would be needed in the car, and thus provide extra support in the vehicles structure. 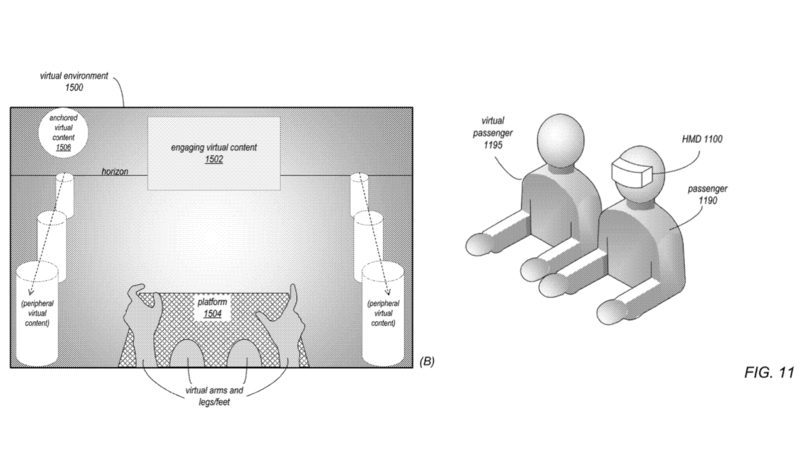 Additionally, the patent includes a system which would utilise a variety of sensors to monitor the passenger(s) and determine is they should begin to feel ill. These sensors, should be able to detect the passengers pulse rate(s), fidgeting, detect sweat or swallowing which are all indications of motion sickness. Then the VR would adjust the experience to help counter the nauseating ride. Included in the system, Apple further adds a level of business and entertainment to occupy the passengers during the journey. For example Apple has introduced ‘virtual passenger’, who could be simulations of authors reading their books, to the passengers, or perhaps a simulated real-time office meeting all conducted in a VR simulated environment. For Entertainment, Apples imagination goes as far as to describe hang gliding, complemented with the cars built-in heating system to complete the experience immersion. Crazy - No? Patents, and imaginations don’t necessarily mean a reality, but what this does show is that major corporations are conceptualising potential real-world usage for various technologies. Virtual Reality is having a spot light year, an companies are trying to figure its use and place in our world. While this concept sounds interesting, the end result may be something more practical.